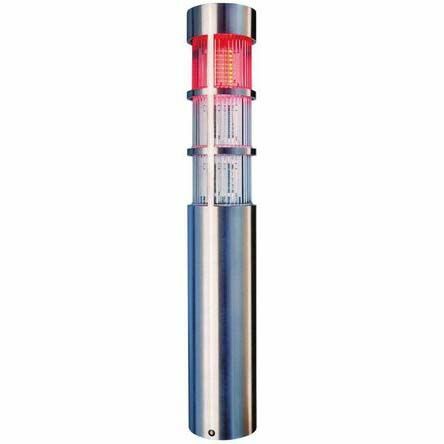 The KOMPAKT 37 is a slim-line LED signal tower available in two versions, either in a black housing with coloured lens or in a metal finish with a clear lens. 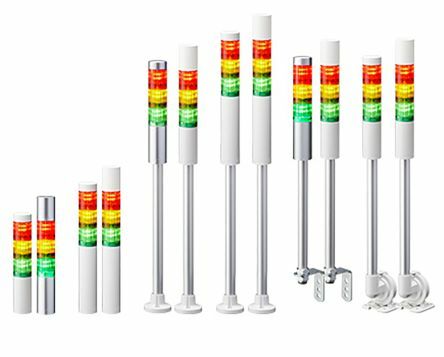 The coloured lens signal towers have coloured LEDs which provide maximum colour intensity, making them particularly effective in lower light environments. In bright sunlight however it can be difficult to see the difference between a coloured lens and an illuminated coloured lens. This is where the clear lens signal tower comes into its own as it is only coloured when in the ON position, therefore ensuring it is not mistaken as being illuminated when it is in the Off position. Thanks to a diameter of just 37.5 mm the KOMPAKT 37 is ideally suited to applications on small machines and equipment with limited space. Also available are versions with a 85dB buzzer integrated into the cap of the signal tower which provide an additional audible warning. High quality stainless steel housingClear domes ensure signalling effective even in direct sunlightCan be operated with PLC control systemLED permanent light (up to 50000 hours)IP65 rating2m cableM22 fixing-20 to +50°C operating temperature range.